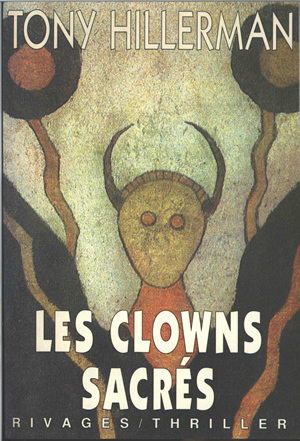 This is the first French edition of Tony Hillerman's novel Sacred Clowns, published by Éditions Payot & Rivages (Rivages/Thriller Collection Dirigée par François Guérif) in Paris. Translated from American English by Danièle and Pierre Bondil. The front cover four-color illustration depicts a horned figure flanked by stylized mountains and trees. The back cover displays the French title, translation credit, synopsis, publisher name, barcode, and price in white on a black background. The inside front and inside back covers are blank.